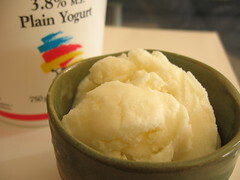 Vanilla Frozen Yogurt - Do You Know The Muffin Man? Notes: Everyone is talking about this new ice cream book and some of the flavours do sound interesting, but I was looking for a frozen yogurt recipe and found this one. You can barely call it a recipe as it only has three ingredients: yogurt, sugar and vanilla extract. The mixture was very runny after 20 minutes in the ice cream machine, but it became pretty solid after a night in the freezer. It's not a bad dessert, not very rich as to be expected, tangy and scented with vanilla. Update: I just realized the original recipe I linked to omitted the crucial step of draining the yogurt. That might account for the watery mixture and hard consistency after freezing.